The EMS Microwave Stirrer makes it possible to magnetically stir inside a microwave oven. By using the oven's turntable drive impeller as the power source. The Microwave Stirrer works in microwave ovens that have a drive impeller as shown below. The Microwave Stirrer mechanism has a gear ratio of 1:58. Refer to your microwave oven instruction manual to determine your turntable RPM. (Example: if the microwave turntable is rated for 7 RPM, the Microwave Stirrer will rotate at 7 x 58 = 406 RPM). Read your microwave oven operating manual very carefully for pertinent information. Do not overheat the substance. Check the recommended heat setting in the microwave manual and follow those directions. Do not heat any substance in the microwave oven that is not recommended for microwave. Refer to your microwave oven operating manual. Use appropriate container for the solution to be heated. Container must be transparent to microwave and resistance to high heat. Place container only on the double layers of silicone rubber mats that are provided with stirrer. The rubber mat insulates the stirrer from hot containers. It is recommended that Teflon® coated Spinbar® Magnetic Stirring Bars be used (Catalog #64517-01 Komet™ Spinbar®). Do not use the Microwave Stirrer if any of the components - interior or exterior - of the unit are wet. Never use closed or partially closed containers to be heated in the microwave. They will explode, with a high risk of personal injury. Note: Even partially closed containers with a loose fitting lid may explode. Remove turntable plate and ring from the microwave oven and set them aside. 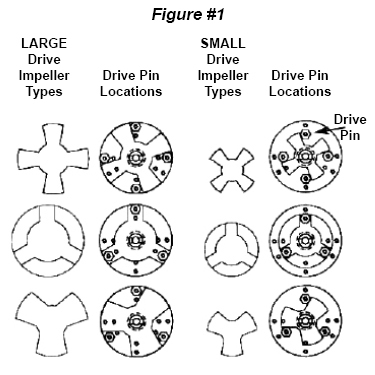 Compare your microwave's drive impeller to the six drive impeller types pictured on page one. If your microwave's drive impeller is not described, please contact EMS Customer Service at 1 800-523-5874. To prevent the stirrer from slipping, ensure that the bottom surface of the microwave oven is clean and dry. Adjust the stirrer's suction cup feet so that they sit on the flat bottom of the microwave oven when the stirrer is centered. Secure suction cups. The impeller in the center of the microwave oven is the driving mechanism for the stirrer. Refer to Figure #1, on page one to determine the drive pin location. Place the center of the stirrer over the drive impeller. The stirrer is now ready for use. Place filled container with a Spinbar® Magnetic Stirring Bar on the silicone mats. Start the microwave oven. The stirring bar will rotate. If the stirring bar is not rotating, stop the microwave and repeat steps 2 to 9 to remedy the problem. *This guide uses 100% = 1000 watts. If the solution requires boiling for an extended period, lowe the microwave power after the solution starts to boil. Do not boil the solution for an extened period at the maximum power setting. Note: Do not attempt to remove the microwave stirrer from the microwave immediately after turning off the oven. A cool down period of between 5 - 10 minutes is required before removing the sirrer from the oven. Clean the outside of the stirrer with damp cloth or isopropyl alcohol if needed. If any liquid gets inside the unit, make sure to dry it completely before using. Do not submerge the unit in the water. Always dry off inside cavity of the microwave oven.